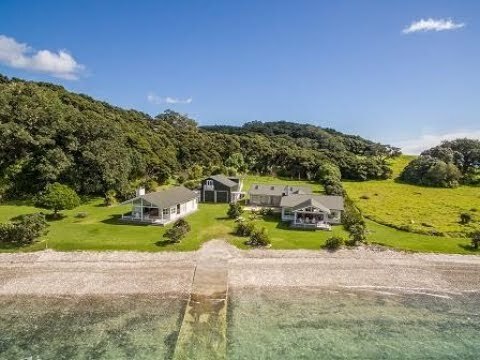 If you're looking for a unique stunning property in the heart of the Bay of Islands then this will interest you. Only a few minutes by boat from the other 144 islands - fishing and scallop beds around the corner & other secluded beaches nearby. Access to the property is by boat, through a private driveway off the Russell back road and a 5 minute boat ride across Orokawa Bay. This nearly 15 acre property sits at the entrance to Orokawa Bay and comprises the western most peninsula and has a home beach in front of the residence and another easily accessible beach over the hill behind the residence. The main house is a classic architect Peter Sargisson design built 18 years ago and still looks a good today as the day it was finished. The property comprises the main residence, a cottage and a boatshed with a large bunkroom above it. This is ideal for a large family group or for two or more families to share - six bedrooms and eight bunks and acres of land for tents if required. The main residence is in two parts, living and bedrooms separated by a large covered deck area. The living area is open plan kitchen, lounge and dining leading onto decks either side with a large open fireplace for cosy winter use. The sleeping wing comprises three large double bedrooms, one with en-suite bathroom the other two share a bathroom. There is also the laundry and a guest toilet servicing that services the living area. The cottage has an open plan kitchen, dining and lounge area with fire place - leading out to deck over-looking the water and three bedrooms, one with en-suite and another bathroom. Behind the two houses is a large two bay boat/utility shed where all the equipment to run the property is housed plus the trailer boat. Above is a great bunkroom, lounge area and bathroom for the kids so they have their own area to escape to. The grounds are low maintenance but features many fruit trees including plum, peach, fig, lemon, lime, fejoa, avocado, apple, mandarin, persimmon & more.